If I had to name one food I absolutely could not live without, it would have to be noodles. I ate noodles almost daily as a child in Singapore, then craved it daily when I moved to the U.S. many years later. And once cold weather hits? Forget about any other dish — I make myself a hot bowl of noodle soup at least once a day, for dinner, lunch and yes, even breakfast. In my Brooklyn kitchen, unless I have just five minutes for a meal, I insist on making my noodle soups from scratch — once you have certain ingredients on hand (garlic, ginger, scallions, good organic broth and perhaps seaweed, dashi or quality miso), this is a fairly easy and quick process. And it’s one you can endlessly experiment with — add some Japanese seven-spice powder one day perhaps, or toss in some kim chi the next. The choices were numerous — there was a tasty Korean-style spicy beef noodle soup I’d whipped up recently, but there also was an old favorite I created a while back, featuring peppery pork balls in a seaweed-bok choy soup. I could do a dry noodle dish (a style that’s very popular in Singapore), featuring noodles tossed in a spicy gravy and then topped with minced meat, wontons, roast meats etc. Or, perhaps a fried vermicelli, just like my mother’s. Recently, however, I made a very simple noodle dish that was so hearty and delicious that as soon as I made it, I went out and bought more ingredients so I could make it again the next day. The broth was a tweaked version of a Martha Stewart recipe for chicken and bok choy soup and the noodles were my favorite wonton style version from Chinatown. How was it? Lovely and gingery, with a nice salty kick from earthy fish sauce. The bok choy lent a nice green freshness to it, too. Don’t forget to check out other Let’s Lunchers’ noodle dishes below! And if you’d like to join Let’s Lunch, go to Twitter and post a message with the hashtag #Letslunch — or, post a comment below. In a large pot, add broth, celery, scallion whites, garlic and ginger and bring that to a boil over high heat. Reduce heat to medium, add chicken, then cover and cook at a bare simmer for about 13 minutes. Remove chicken from broth. When cool enough to handle, shred it and set aside. While this broth has been simmering, bring a small pot of water to a boil, add noodles and cook according to directions, until al dente. Drain and run briefly under cool running water and set it aside in the bowl in which you plan to serve the noodle soup. Add bok choy to broth and simmer for about 5 minutes, then stir in fish sauce and season with salt and white pepper. Add shredded chicken to the broth, stir it up. 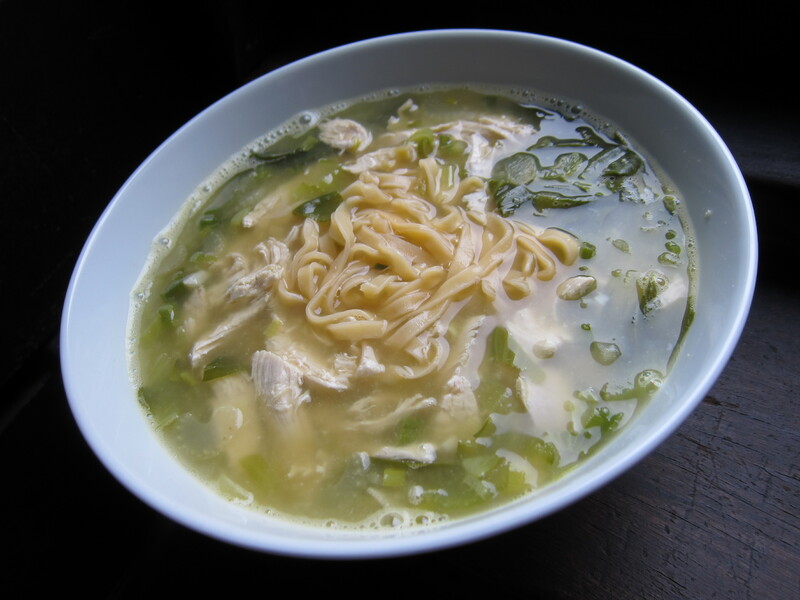 Once that starts simmering again, the soup is ready — just ladle it over the noodles and sprinkle with scallion greens.